WeWork and Bunker Labs Detroit invite you to the capstone event for the Winter 2019 WeWork Veterans In Residence Powered by Bunker Labs tribe. Veterans in Residence offers the United States military veterans and spouses fully-sponsored workspaces to help entrepreneurs build and grow their businesses. 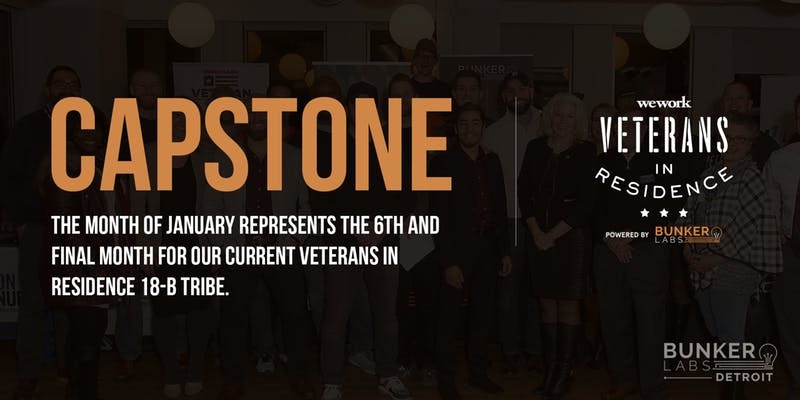 The capstone event will celebrate the work of the Veterans in Residence tribe over the last six months. Veterans in the tribe will briefly provide an update on what they have accomplished over the during their residency, the future of their entrepreneurial ventures, and any support they need going forward. Each veteran will also have a booth highlighting their company. Delicious food and beverages will be served. The capstone event will be held at the will be hosted at WeWork . The WeWork Veterans in Residence program powered by Bunker Labs provides fully sponsored workspace to tribes of 10 veterans across 14 cities every six months. Veterans and military family members should apply to their nearest city. WeWork is also proud to announce our commitment to hiring 1500 veterans over the next five years and will support member companies in hiring veterans as well. For more information, visit we.co/veterans.